I said in the previous posting, Yellowstone is BIG, REALLY BIG! In three days of visiting we have driven 370 miles inside the park and still haven’t been to all of the sections of the park. Yellowstone is about the same size as the state of Delaware. Yellowstone Lake is about the size of the state of Rhode Island. Friday we went to the southern part of Yellowstone, the West Thumb area. Yellowstone had the heaviest snow fall in a decade this year and the southern part of the park is covered in deep snow. Anyone coming to Yellowstone for Memorial Day should leave their hiking booths at home, bring skies. Just a very few trails near Lamar Valley, in the northern part of the park are open. 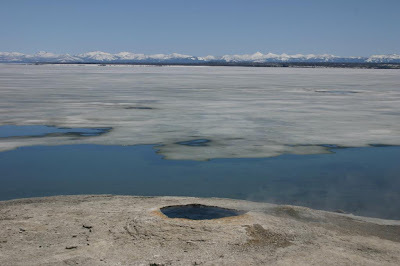 Yellowstone Lake is so big that there isn’t any one place you can stand and see all of it. 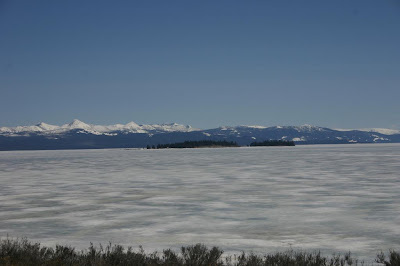 As you can see in the pictures, Yellowstone Lake is still frozen over. 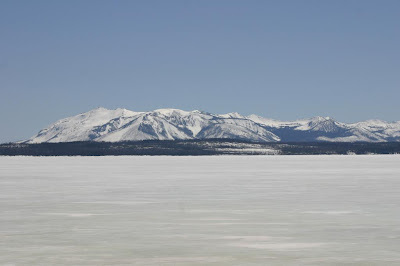 We decided to follow the road along the lake to Canyon and then come back to West Yellowstone via the Norris and Madison areas. As we were driving along we saw a crowd of people at a pull out area. 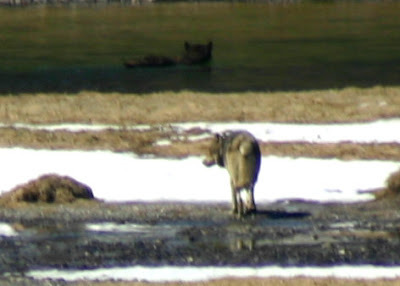 We stopped to ask what they were watching and they said,” wolves”. This area is about 50 miles from where we had seen wolves previously. The wolves had crossed the road and went into some trees. 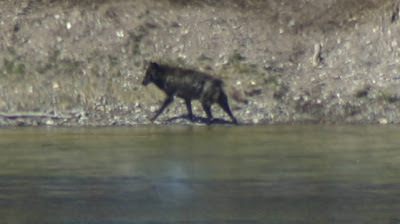 Next they came out of the trees and swam across the Yellowstone River. They stayed in plane sight as they walked about a mile along the river bank and then went into a forested area. As you can see we were much closer than the other day and got some pictures. 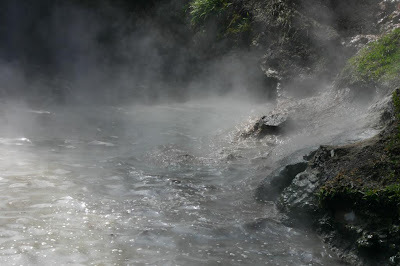 The west Thumb area doesn’t have any geysers, but it does have thermal springs and pools. Some of the springs are under the lake and keep the ice melted. Near where we saw the wolves is an area known as the Mud Volcano. 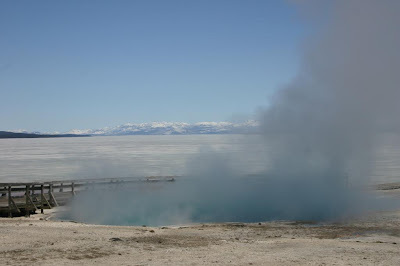 In the early 1870s it erupted and splattered mud for almost two years then it finally exploded and left a very muddy thermal pool. One of our favorite features in the park is the Dragons Mouth. 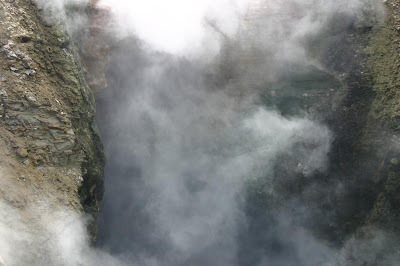 It is a thermal pool in a cave that bellows as the water comes to the surface in a boil. It is said that in a quieter time before cars came to Yellowstone that you could hear the Dragons Mouth for miles. 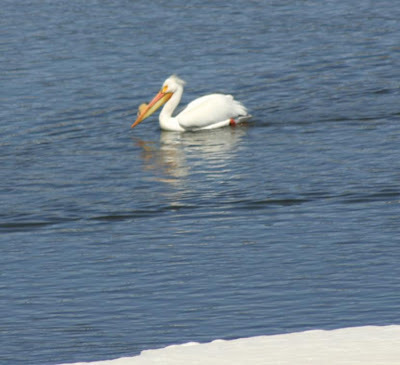 In the areas of the lake that are kept open by thermal springs and along the Yellowstone River we saw many birds some of these included: American White Pelicans, Horned Grebes, Buffleheads, Common Loon and Common Golden-eye. 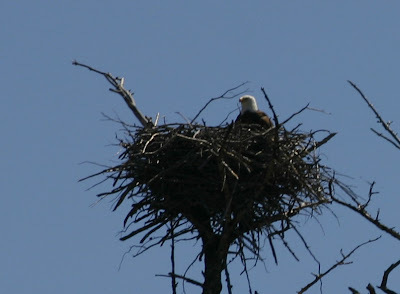 We saw Bald Eagles in several different locations and Robins and Mountains Bluebirds seem to be everywhere. Raider is an embarrassment to Golden Retrievers everywhere because he doesn’t like water. He refuses to go outside if it is raining or if he can here sprinklers running. However he loves snow! He will go out of his way to walk or run on the snow and even if he falls through up to his chest he continues try to walk through it. 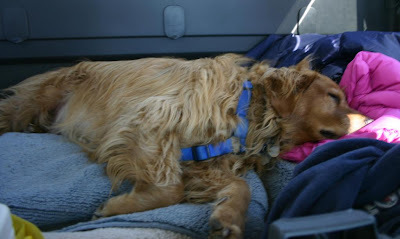 Naturally, walking through deep snow is very tiring. Here he is in the back of the truck after a long romp! Raider looks so comfy on his throne of towels! There is an air mattress under the towels so the bumpy roads won't disturb his sleep.